In the late 1980's, someone told me about a phenomenal garden in Lamar County, south of Griffin, Georgia. It was early May, and I drove down to Ruth and Dennis Mitchell's house in the country. As I came to a stop sign opposite the house, which was set back from the road, I got the first hint of what was to come. Under several large, spreading pecan trees was a field of white daisies. Beyond, I could see swaths of color in front of a white clapboard house. I was astounded as I drove down the dusty driveway. At the time, I had been writing for the Atlanta Journal and Constitution for two or three years. I think the column was called "The Southern Gardener" then (it changed over the years; Southern Living made us stop using that title). The premise was that I would find interesting gardeners and write up their stories. Discovering Ruth and Dennis actually ended up sending my life in a new direction. I was totally bedazzled by the Shirley poppies (there were thousands), the roses, peonies, sweet williams, bluebonnets (yes, in Georgia), the cobalt blue bachelor's buttons, the orange and yellow California poppies, the Flanders Field red corn poppies, the orange cherianthus, the wild petunias in every hue of pink and purple and lavender, the dark pink verbena clambering over a tree stump, the cherry red drummond phlox, the iris, the foxgloves and on and on. The cottage-type flowers covered several acres. But, it was the Shirley poppies that almost blinded me. They were Ruth's specialty and came in the most beautiful colors - a double clear pink, pure white, lilac, salmon, dark rose and red with white edges. I can tell you that when mixed with the electric blue bachelor's buttons, they would take your breath away. I rushed back to Atlanta and wrote up their story. I couldn't believe my luck in finding such a garden and such delightful characters. Apparently, about a century before I drove down Ruth and Dennis's driveway, a Reverend Wilkes, vicar of Shirley Parish in Southeastern England, noticed a poppy at the edge of his garden, next to a field where the wild red version grew. 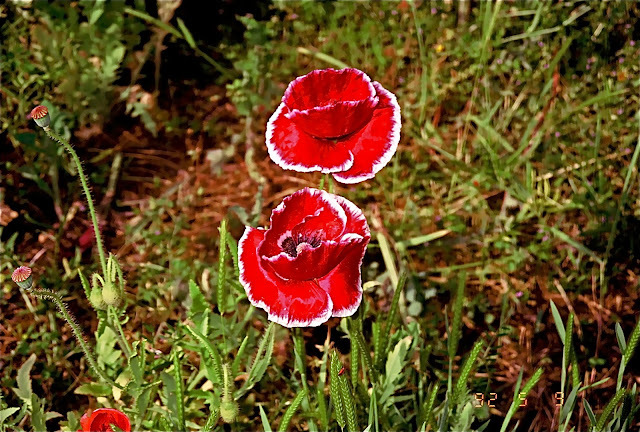 The clump of poppies was indeed red, but the flowers had a white picotee edge. For years, Rev. Wilkes observed the anomaly and began selecting flowers that deviated from the wild red corn poppy. He developed an entirely new strain, which was still Papaver rhoeas, but with unique, dazzling colors. So, how did what became known as Shirley poppies send me in a new direction in life? I did a story on the couple (she was from Lamar County, and he was from England via Australia) for the paper. I also took a movie camera down there, and having never worked one, came away with several views of my brown loafers. But, I did manage to capture the brilliant colors of the poppies, mixed with all those other flowers. Long story short, I ended up showing the home movies to my neighbor Kathryn MacDougald, and after that, we went on a journey to get a show on television (easier for a camel to pass through a needle's eye, I assure you). We shot the pilot of A Gardener's Diary the next May at the Mitchell garden, when the poppies were once again in bloom, along with all the aforementioned flowers (there were lots more, but I'll spare you another list). The series launched with the Home & Garden Channel (HGTV) on January 1, 1995, and we produced shows for 11 years. It's sort of crazy the way fate works. If Rev. Wilkes had not noticed the aberrant red poppies with the white edges and then developed an entire strain of new colors, would I have had a TV show? I don't think so. The photograph above was taken in Ruth Mitchell's garden on the day we shot the pilot (you can see the date on my slide down in the right hand corner). These poppies must have looked a lot like those discovered by Rev. Wilkes. I have to marvel that a hundred years later, my life took a drastic turn all because of a red poppy with white edges. If fate can hinge on a particular flower, I'm wondering if something else will send me off in yet a new direction. It will be interesting to see. I so miss A Gardeners Diary. Wish they would release it to Hulu more.